For my second Pink Wednesday post (last week I forgot that it was Wednesday! LOL), I have a Rimmel London polish for your viewing pleasure. 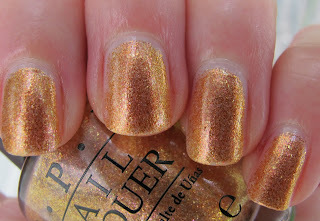 I don't own many Rimmel polishes, but this one makes me think I should get some more. 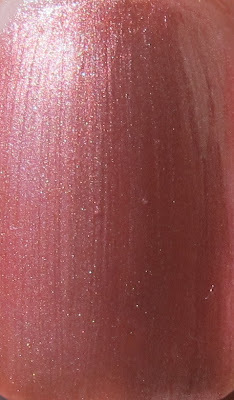 This beauty is Rimmel Lasting Finish Pro in Pink Zinfandel. 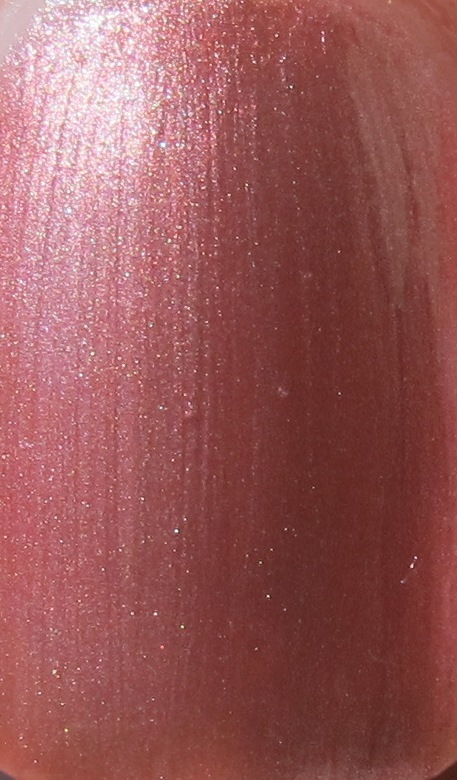 I would call the finish of this blush pink polish a frost, but don't let that scare you off. 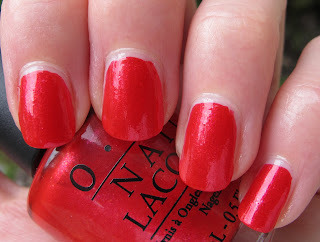 There are no brushstrokes to be found, and this polish is very flattering. Blush pink is usually not really my style, but I found myself really liking this one. Maybe it's because of the dusty beige tint to it. This is three coats, but two would be fine for normal wear. Pink Zinfandel applied nice and smoothly. The Rimmel Lasting Finish Pro brush is wide and curved, just like the Sally Hansen Insta Dri brush, but it is less stiff than the Insta Dri. I have actually grown to love the Insta Dri brush, so I have no complaints there. 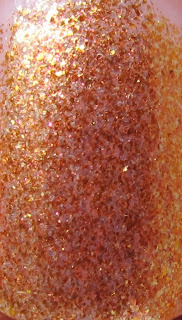 Overall, I like this color and love the consistency and finish of this Rimmel polish. 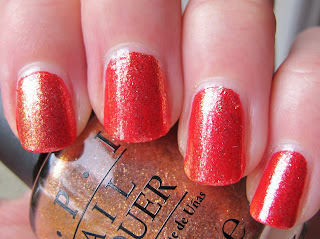 I'll definitely be checking out the Rimmel polish display on my next trip to the drugstore to find more Rimmel gems! By the way, Rimmel makes my FAVORITE drugstore mascara and I need to pick up another one. It's called Lycra Lash Extender and comes in a black tube. It is beyond excellent! 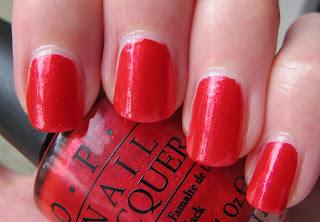 Rimmel polishes are available at a drugstore near you. They have a where to buy section on their website if you need help finding a store! This polish was sent to me for review by a PR agent for Rimmel London. For more information, please see my Disclosure Policy. I survived Tropical Storm Irene very well, I know you were all thinking of me and other East Coast bloggers! My house had no damage, just a lot of tree branches down in my yard and loads of debris to clean up. I spent a lot of yesterday cleaning up and still have loads to do. 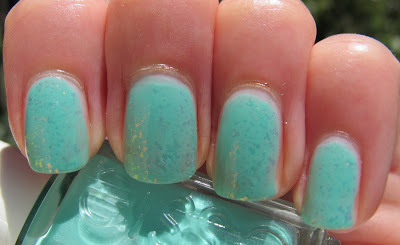 I know you're all dying to know what mani I sported during the tropical storm, so here it is!! 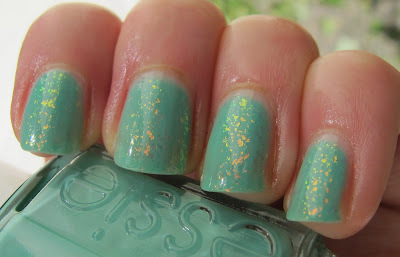 I wore Essie Turquoise and Caicos, with Nubar 2010 on top. 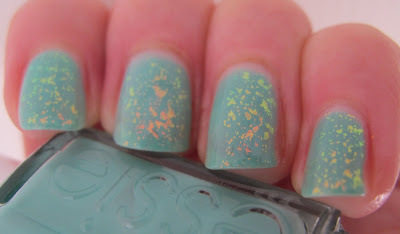 This is three coats of Essie Turquoise and Caicos. 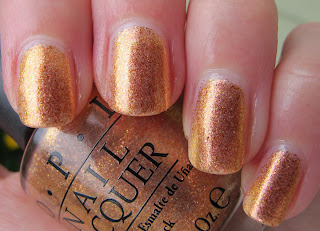 It still has some VNL, this polish is not quite as opaque as I would like. It is a very beautiful pale watery blue-green though. I love the color! 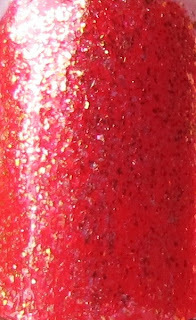 I did two coats of Nubar 2010 on top to add some zing! 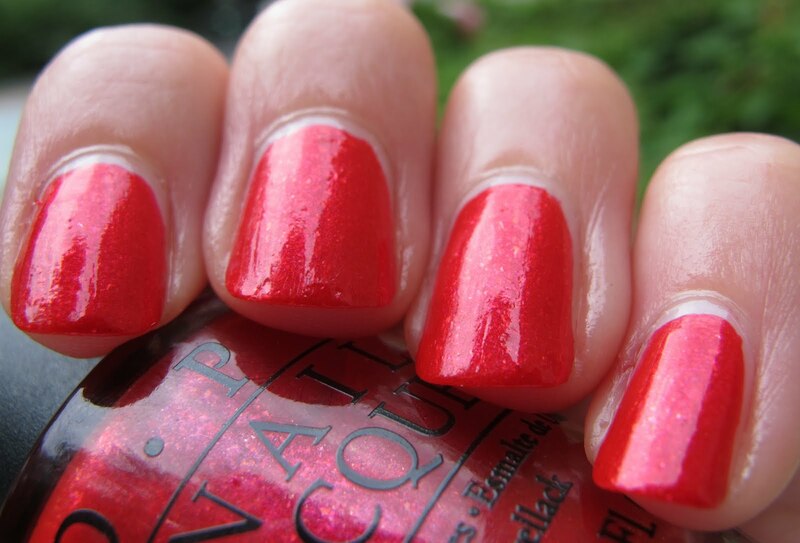 This mani was beautiful in person. It looks nice in the photos, but it was much prettier in person. I needed something pretty to get me through Irene, I was really worried about trees coming down on our house. I'll leave you with a picture I took of a street near my house. This street is right on the water and has flooded before. 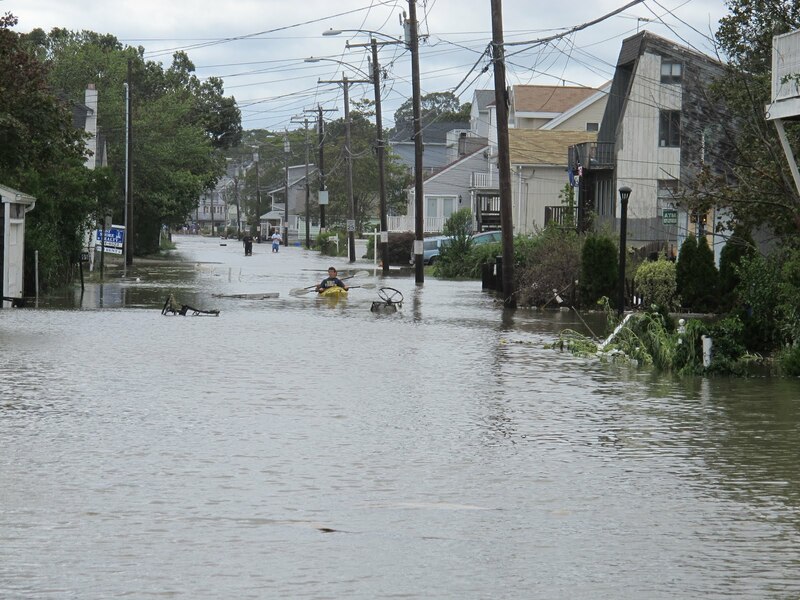 Yes, those are two guys kayaking in the street. There was quite a lot of street kayaking going on. The non-amusing part is that many of the houses on the left side of this picture were completely destroyed and have to be knocked down. Very sad for the people that live here. 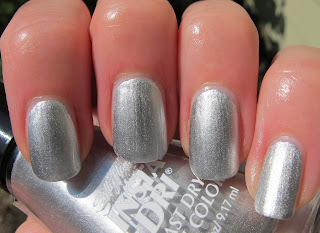 One-Coater Alert: Sally Hansen Insta Dri in Silver Sweep! 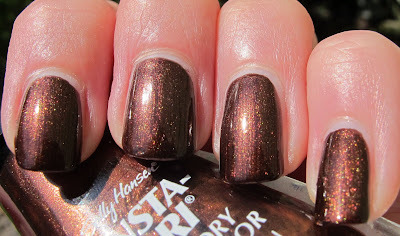 The drugstore polish companies are REALLY stepping up their game this fall. 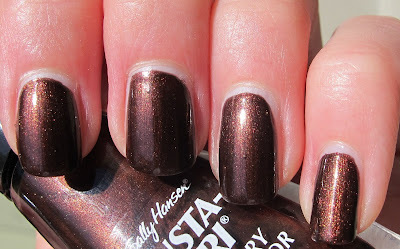 I can't even tell you how much I am loving Sally Hansen polishes this fall. 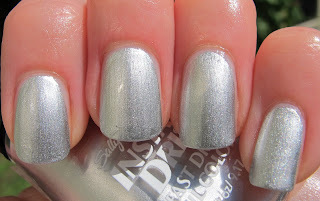 Case in point: Sally Hansen Insta Dri in Silver Sweep. Check out this amazing true silver foil. 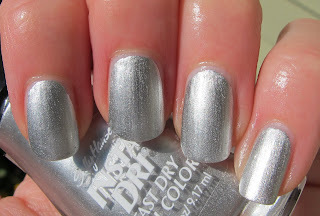 This polish immediately replaced my previous favorite silver for the Number One Silver in my collection. What's so good about Silver Sweep? For one thing, it's a ONE-COATER!!! Yes, this look that you see in these pictures in one coat. 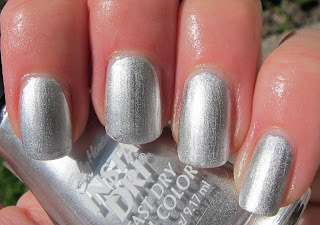 There was no need for a second, I could not see any sign of my nails, just flashy silver goodness. For another thing, it dries FAST! This makes for a super quick mani. Given my propensity to wear silver around the holidays, and my other tendency to be Last Minute Sally during the holidays, I can tell I will wear this constantly. I did use one coat of top coat here, but Silver Sweep looks fabulous without it if you're in a major hurry. Application was dreamy, so easy and pleasant. Overall, this polish gets an A+. 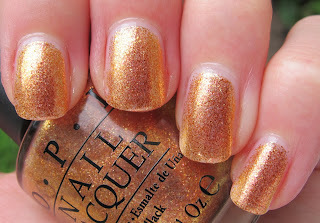 Seriously, it's one of the best polishes I've tried in recent history. 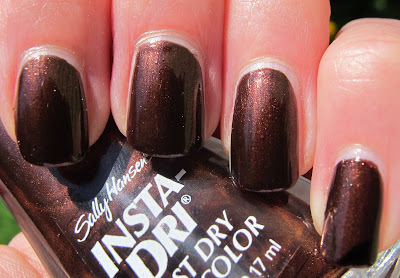 If you like the Sally Hansen Fall 2011 Insta Dris I have posted so far (Bronze Ablaze, Ruby Rush), never fear, because I have two more coming up soon!! You can find Sally Hansen Insta Dri in Silver Sweep at a drugstore near you. 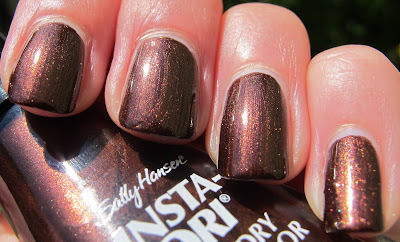 Find a store that sells Sally Hansen products on their website. Just a little non-polish info for you all- where I live in CT in directly in the predicted path of Hurricane Irene. CT Light and Power has already estimated that we could be without power for a week if we are hit directly. So, I have another post scheduled for tomorrow, but if you don't hear from me for a few days, that means I have no power! I will hopefully be back soon, and I hope everyone on the East Coast stays safe! 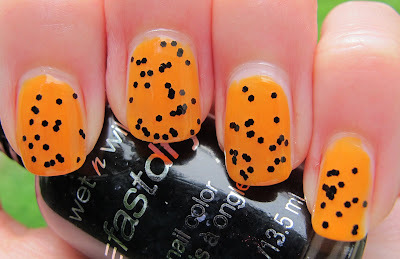 For my first (and very early) Halloween NOTD, may I introduce to you Wet n Wild Tangled In My Web, of On The Prowl fame? Yes, that's right, I managed to find the Halloween-themed On The Prowl collection and grabbed all of the glittery shades. So you'll be seeing them all soon! 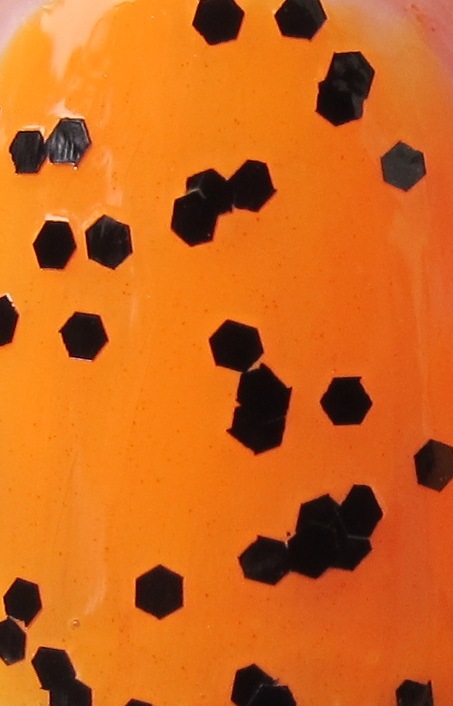 Tangled In My Web is a lovely black hexagon glitter in a clear base. 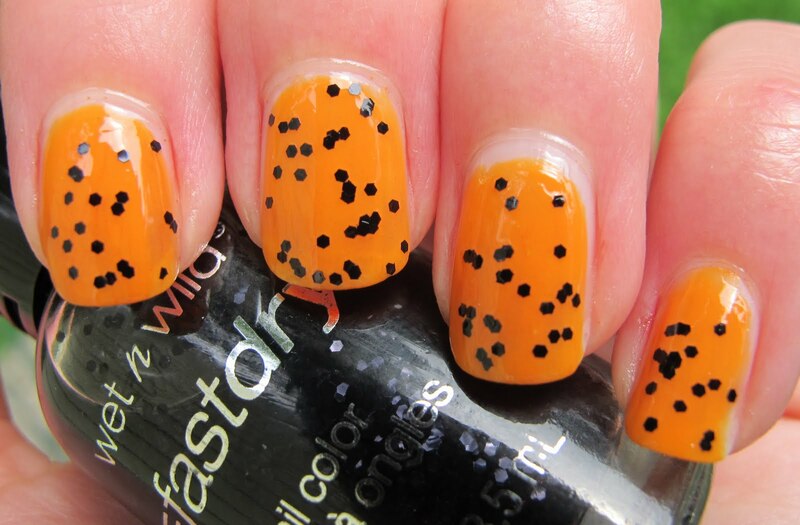 For this look, I used it over two coats of Wet n Wild Wild Shine in Sunny Side Up, a yellowed orange. This is two coats of Tangled In My Web, but I found it easier to kind of pat the glitter on, rather than actually painting it on like a regular polish. That way, I could make sure the glitter was somewhat evenly applied. 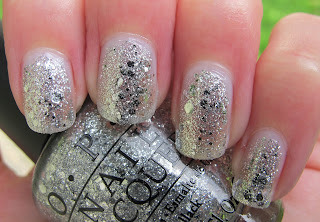 I love black glitter in polish and I don't think there are enough polishes with black glitter in them. So this way, I can add a layer of black glittery goodness whenever I want! 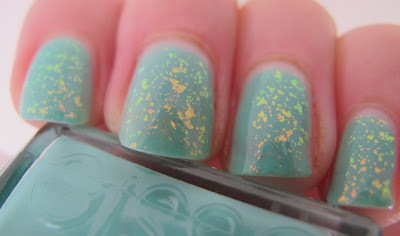 The Wet n Wild On The Prowl collection, while awesome, is a bit hard to find. I found mine at a Harmon Discount Beauty store near me. Wet n Wild has a where to buy on their website, so check that if you don't know where the brand is sold near you. This beauty of a press release was in my inbox today! Can I just say MEEP!!!! I can't wait for this collection. 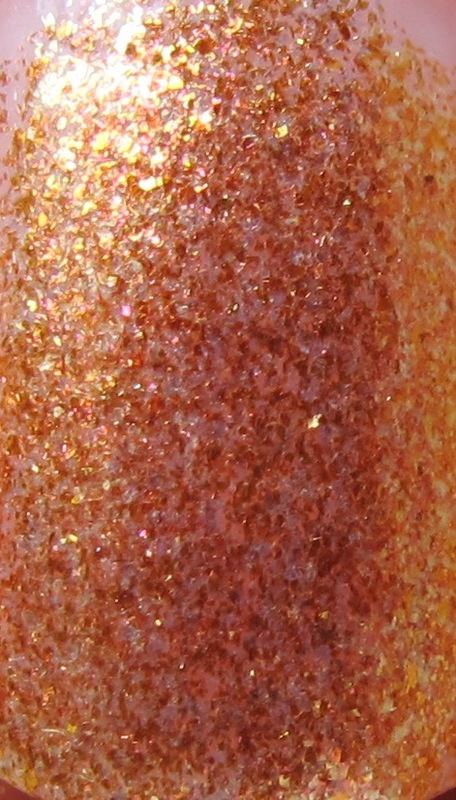 I would do stupid things to obtain these glitters. Come November, if you see a headline that reads "Connecticut woman dropkicks shoppers at local Ulta in frenzy to grab nail polish", you'll know who to blame. Also, I have two words for you: RAINBOW CONNECTION. And three more words: BUYING 10 BOTTLES. 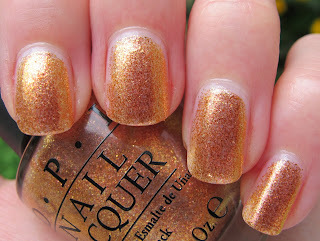 "Sending “Warm & Fozzie” Wishes from OPI! This limited edition promotion will be available beginning November 2011 at Professional Salons, including Beauty Brands, Beauty First, Chatters, Dillard’s, JCPenney, Pure Beauty, Regis, Trade Secret, and ULTA, for $8.50 ($10.95 CAN) suggested retail for each Nail Lacquer." 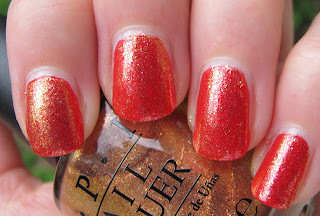 Remember my thoughts on the OPI Miss Universe collection? Well... I have to eat my words. "Kinda lame"???? What was I thinking? It's so hard to tell what a collection will be like based on those computer generated bottle pictures, but this one REALLY surprised me. You obviously need to read more and, of course, see a bazillion more pictures! If you are an avid reader of nail polish blogs, you may be a bit confused about exactly what season it is here in the US right now. 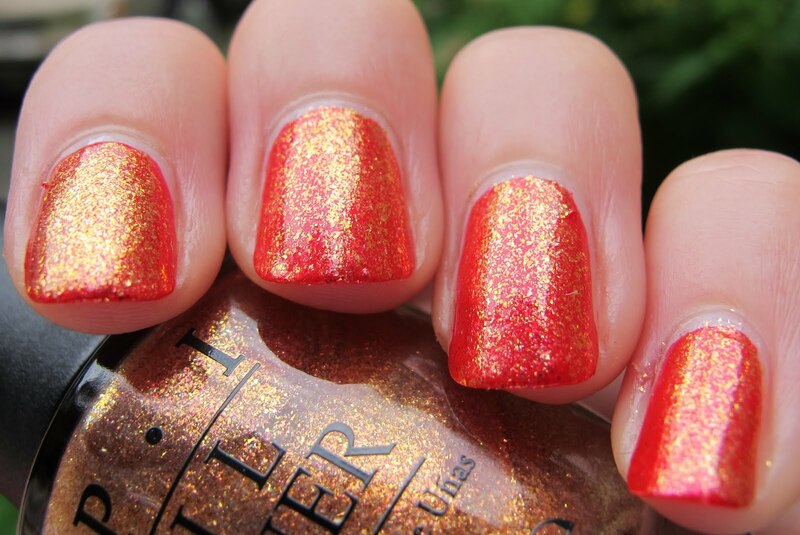 Nail polish blogs are flooded with fall collections, Halloween polish and previews of holiday goodies. Yet, it is still warm outside and my 365 Cats calender reads "August". Never fear, I have a post for you today that should clear up this confusion. 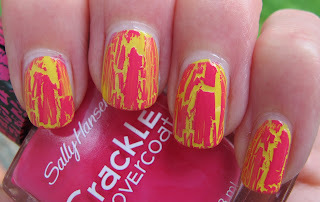 I am currently sporting Sally Hansen Insta Dri in Lightening with Sally Hansen Crackle Overcoat in Fuchsia Shock. This color combination must mean that IT'S STILL SUMMER! Now that we've established that, let's talk about this excellent color combo. 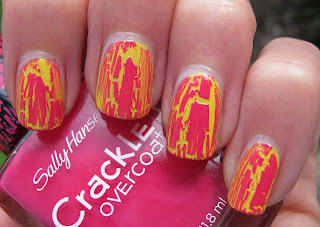 Pink and yellow is a really cheery pairing, and these two polishes in particular work very nicely together. 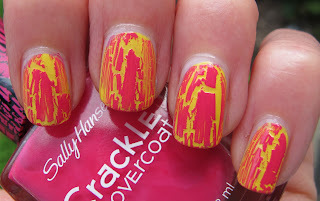 This was my first experience with Sally Hansen Crackle Overcoat, and I think it's excellent. It dries and cracks VERY quickly, so just make sure you get a nice large bead of polish on the brush and apply a kind of thick coat. Otherwise, it can start to dry too fast. If you're looking to sport a few more summer manicures, give this look a try. I was feeling a tad grumpy today, but it really cheered me up immediately! It's just so bright and happy! The pink looks graffiti-ish against the yellow, doesn't it? I had fun with this one, and that's what nail polish is for, right?? 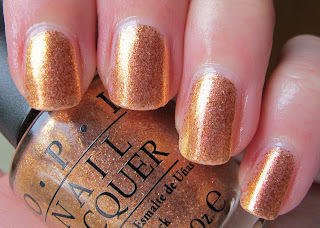 Anyway, the next few weeks on Never Enough Nails are going to be interesting. I have a TON of fall stuff to show you, some Halloween treats I found, and I also still have a few summer looks that I want to share. So it's going to be a pretty mixed bag, but I promise, it's all good stuff! 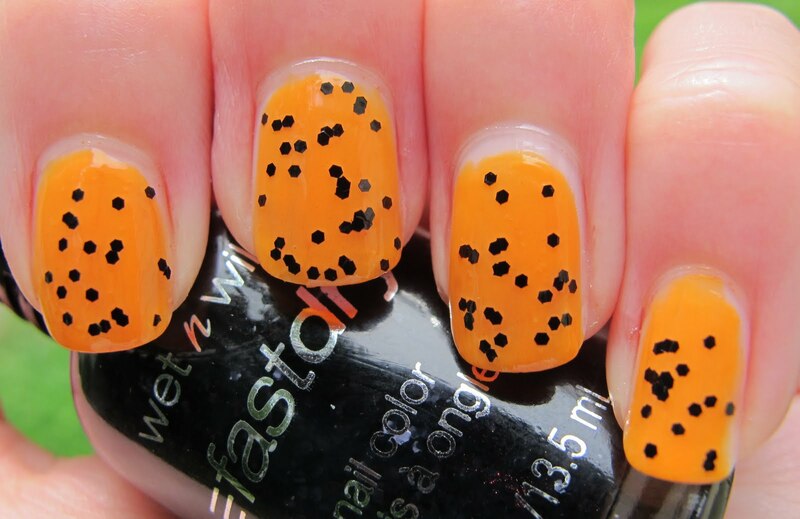 To find out where Sally Hansen products are sold near you, check their store locator at sallyhansen.com. 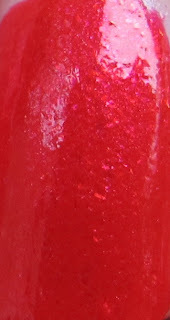 Sally Hansen Fuchsia Shock was sent to me for review by a PR agent for Sally Hansen. For more information, please see my Disclosure Policy.